Put your knowledge to good use with the best boxing odds online at Pinnacle. On April 20, former world champion Amir Khan will look to become the first man to beat Terence Crawford when they square off for the American's WBO welterweight world title. Crawford is unbeaten in 34 professional fights, is a three-weight world champion and is seen as one of the best pound-for-pound fighters in the world. Looking for value in the Crawford vs. Khan odds? Read on to inform your Crawford vs. Khan prediction. The Money Line odds suggest this is a fight that will be one-sided. Crawford is the heavy favourite, and the odds propose the champion has approximately a 95% chance of victory. The huge edge here is predominantly due to bookmakers believing Crawford is an elite pound for pound level fighter together with the vulnerability that Khan has shown throughout his career when facing fighters who carry a high knockout percentage. The Total Rounds is set at 9.5, with Over 9.5 rounds priced at 2.800*, which suggests there is around a 35% chance that the fight will go long so an early finish is favoured – however, there could be value in the fight going the distance. What are both fighters’ strengths and weaknesses? The betting favourite in Crawford has a brilliant ring IQ, and he seems to have the special gift as a fighter to figure his opponents out and adapt in the ring. He can press forward and fight on the front and back foot with good punching power, and can also punch well to the body which makes him a very good all-round boxer. The 31-year-old southpaw was last seen in a ring in October, where he stopped the solid Jose Benavidez Jr in the 12th and final round with a perfectly timed shot – a punch that took Crawford's knockout percentage to 74% - whilst his overall record boasts wins over Ricky Burns, Breidis Prescott, Viktor Postol, and Jeff Horn. Khan is naturally an offensive fighter and his major strength is hand speed. The 32 year-old throws blistering combinations and often tries to overwhelm and fluster opponents with his attacks. He has the hand speed to trouble Crawford and will need to lead off his jab at range and move in quickly to land combinations if he is to be successful in the fight and stand any chance of winning, much like his performances against Devon Alexander and Luis Collazo. His main weakness has always been his defence after being offensive - he will often throw too many punches then leave his chin high in the air and wide open after the flurry, which then leads to him being caught by punches that take maximum effect and inevitably leads to getting knocked out – an irrational tactic for a fighter with questionable punch resistance. Khan has won seven of his last 10 fights spread out over the last seven years. With inactivity in-between, the former Olympic silver medallist has six hard-fought decision wins, but two devastating knockout losses to Canelo Alvarez and Danny Garcia. 100% record against Southpaws: Is Khan overpriced? There are two stances in boxing: orthodox and southpaw, orthodox is when a fighter is right-handed, and they lead with their left hand and keep the hand they feel is stronger held back; southpaw is if you’re a left-handed fighter, you lead with your right hand and keep your left hand back. Khan, throughout his career in both the amateurs and professional game has found multiple ways to nullify southpaw fighters and has never lost to one as a professional. He does this by keeping busy, always keeping his left foot on the outside, and going through with straight shots. Southpaws, the usual nightmare for most boxers, are not something Khan has struggled with too often and it seems he actually favours fighting them due to his fighting style. Crawford is well-known for his deceptive ability to switch between the orthodox stance and southpaw one, a style which can be confusing for his opponents, and has helped the American dominate fighters in the past – and it is likely he will continue this to avoid giving Khan any advantage in the fight, but it is a key area that should be monitored by bettors when looking for value in the fight – with most of Khan’s best performances coming against southpaws. How important is Khan reuniting with Virgil Hunter? Khan has predominantly done well in his career when he can use length and box at range keeping his opponents at arm’s length, when he can’t apply this advantage he gets dragged into a fight which is detrimental to his style, and he struggles. Being back with Virgil Hunter is a good move from Khan, the former world champion is a fighter who needs very strict instructions, and a strict game plan on how he can win a fight. He’s blessed with tremendous hand speed and is athletically gifted, but is often defensively reckless and fights with his heart instead of his head. Legendary trainer Joe Goossen recently guided Khan to wins over Phil Lo Greco and Samuel Vargas, but Hunter is a man who will get Khan’s fundamentals right. He will want him to box, be smart and not make mistakes, making it clear that he will need to keep the hands up when he throws a punch and a solid defence will lead to a good offense in this fight. Hunter is a trainer who thinks defensively first, which is the kind of approach and style Khan needs to be successful against one of the current best fighters in boxing. Hunter has known Khan for a long time, and knows his fighting style and flaws, so will design a game plan to maximise his chances of being victorious. 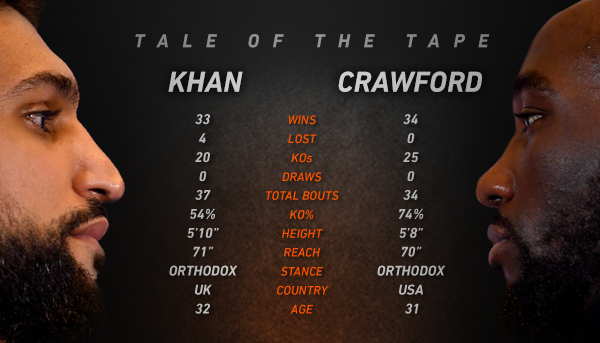 Crawford vs. Khan betting: Where is the value? Khan’s experience and skill cannot be overlooked in this fight and is talented enough to beat high level opponents providing he doesn’t sway from his game plan. It does seem the odds should be closer than the bookmakers have priced, and it is worth bettors noting that Khan has only ever been odds against once in his entire career and that was against Canelo Alvarez, when he jumped two weight divisions. Khan opened at odds of 3.500 against the Mexican, giving him around a 25% chance of victory – so to see Khan priced at 9.900* giving the Brit just a 10% chance of victory demonstrates how highly bookmakers rate Crawford. Crawford has looked very good in almost every fight he has been in and justifies his tag as favourite heading into the bout, but when you compare both fighters’ records, it’s difficult to see how he is such a colossal favourite. If Khan’s trainer Virgil Hunter can get the Bolton man to keep his discipline he can certainly give Crawford problems, and go 12 rounds in this fight, which potentially makes a bet on Over 9.5 rounds at odds of 2.800* a value bet. A value bet is one where the possibility of an outcome happening is better than the likelihood reflected in the odds. The best possibility of value for bettors on the Money Line is using an in-play strategy to follow with a back to lay bet on Amir Khan. As a notoriously fast starter, Khan has the speed and the range to narrow the in-play price on himself from 9.900 in the early rounds, and bettors can then lock in an early profit on the fight regardless of the result.